On a gray Saturday morning on the 8th of October, Trafalgar Square came alive with colors, chants and songs as people from all walks of life and communities came together on the 10th anniversary of the Afghanistan War in protest against Britain’s involvement in the conflict. The rally was organised by the Stop the War Coalition, the Campaign for Nuclear Disarmament, the British Muslim Initiative, as well as groups ranging from the Palestine Solidarity Campaign to the Free Shaker Ahmed and Close Guantanamo campaigns. It showcased short films, comic exhibitions, live music performances and speeches from notable activists and journalists. More than 2,000 people attended, including students, artists, trade unionists, academics, armed forces veterans and military families. The keynote speakers were Jeremy Corbyn, Labour MP for Islington North and the head of the Stop The War Coalition, award winning Australian journalist John Pilger, Wikileaks founder Julian Assange, and the British MP and vocal anti-war activist George Galloway. They made their points, but it didn’t go much further than that. John Pilger criticised American and British administrations for sending soldiers to fight the Taliban while pursuing oil interests in Afghanistan by negotiating with and bribing Taliban officials. He praised the anti-war movement as a rallying call to citizens who want to win back democracy from “war-mongering political and corporate elites.” “From Egypt, Chile, Wall Street to Trafalgar Square, civil disobedience is powerful. Citizens should never underestimate their strength as politicians fear such movements,” he said. Julian Assange criticized journalists for misleading people through the media blitz which promoted the case for war in the run-up to the Afghanistan and Iraq conflicts. “Wars are peddled to the world through lies constructed by those who are close to those they are meant to be policing,” he said. He appealed to people to support the work of Wikileaks. “Get the truth and give it to us, and we will spread it all over the world,” he concluded. The final speaker, Jeremy Corbyn, said the anti-war movement should not fear the political rhetoric or media campaigns aimed to undermine it. He stated that it is up to British citizens to use democracy to put an end to the government’s military adventurism. “Stand together for peace, for justice, and keep up the pressure on the government,” he said. While anti-war intellectuals were out for the day protesting through eloquent words, there were very few listening. Even though the Afghanistan War was the main theme and 2,000 people had gathered, the crowd was divided under different banners, from the Palestinian cause for statehood, to justice for rendition victims, to diplomatic action against Middle Eastern dictators, to the Hare Krishna movement. The rally ended up presenting an ambiguous political message. The news media present at Trafalgar Square appeared to consist entirely of freelance photographers and budding journalists in search of a scoop from the keynote speakers. News reports of the rally surfaced on fringe online media elements, on blogs and local news websites like the Metro and Demotix. Pilger, Assange and Galloway granted media capital to it with their short appearances, while Jeremy Corbyn, a backbench MP, failed to rope in his colleagues’ support. This is no surprise, as it was the Labour government which started the war in Afghanistan in the first place. Corbyn by himself was unable to grant the movement the political leverage it would need to call the government out. After the speeches, the activists and rally supporters gathered and marched to 10 Downing Street to deliver a petition calling for the recall of British troops stationed in Afghanistan. 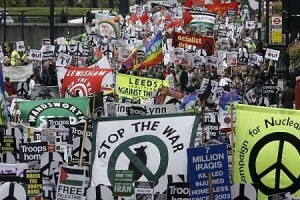 People chanted slogans like “1 2 3 4 we don’t want no bloody war…. 5 6 7 8 spend it on the welfare state,” and “You say warfare, we say welfare.” After delivering the petition, the protesters squatted in front of 10 Downing Street, blocking traffic as news vans were on site and news helicopters circled overhead. No government minister came out to make any statements, and the Metropolitan Police slowly began to circle the crowd and close ranks. Protesters standing their ground on the streets were pushed back by the police, to which they shouted, “Shame on you! Shame on you!” The demonstration continued for a couple of hours and was overall a peaceful one. However, the police presence and the traffic holdup later compelled the protesters to slowly move out of the street. The march was mostly a leaderless mob of people with no idea what they were supposed to do outside Downing Street. The keynote speakers did not even accompany the protesters. The presence of Assange, Pilger or Galloway at the gates of the Prime Minister’s residence might have been a significant media event which would have had a better chance of courting government attention than a bunch of enthusiastic students, activists and artists shouting slogans. The protest turned out to be a one-day affair at a single location in the country. Unlike the Occupy Wall Street movement or the anti-corruption movement in India, the event was not planned to last or spread, and it elicited only a short-term commitment from supporters. Enthusiasm seemed abundant for a while, but as nightfall came people started exiting the scene. Even though the 8th of October was a significant date, after 10 years the Afghanistan War has become a politically vacant issue in Britain. British citizens are currently more concerned with domestic issues like cuts to the welfare system, rising tuition fees and a lack of jobs, while the mainstream media has become preoccupied with analyzing the effects of the financial crisis in Europe. With the lack of media or political momentum beforehand, springing it on people that day failed to gather greater support. The rally was devoid of any strategy or political strength and gave the government the easy solution of letting the day pass without making any statements. It was a weekend outing for anti-war activists and an interesting project for student journalists and bloggers, but not any part of a significant people’s movement. I think the occupy movement has gone to your head. What you describe could be used word for word to describe day one of the wall street occupation; lots of pompous speech makers, disparate groups with no one clear unified target, lots of amateur journalists, not even the blink of an eyelid from any politician, a lot – and I mean a lot – of confusion about what to actually do upon on arriving at Zuccotti Park. The fact that the occupation has lasted, is ongoing, is what I like the most about it, and why I think most other protests fail to influence the national conversation, but let’s not start writing everything off when it isn’t an instant and ongoing global movement. You’re in danger of sounding like a scenester snowboarder, raging about noobs and weekend warriors. It’s a bit flat. I think the author makes quite clear that it is precisely this rally not lasting that was its problem. He didn’t compare it to the first day of OWS, but to the momentum it has created since. Believe me, those of us at Waging Nonviolence are under no illusions about the humble circumstances from which Occupy Wall Street arose! We’re on the same page as far as lasting impact goes. The massive half a million strong TUC march in London earlier this year was toothless precisely because afterwards everybody just went home and forgot about it. But not every single action can be occupy wall street, and it’s still fantastic that ordinary people are willing to take to the streets at all. They should be celebrated, not scoffed at for being too vanilla. I don’t think we should be so quick to start holding OWS as any kind of standard just yet. I am 100% for it, but I think it’s prudent to remain humble and view the occupy movement as one part of a greater global awakening. I would agree with the insinuation that we know now that one day events don’t have near the impact of a sustained effort and constant growth, but let’s not start judging others for not being just like us already. In fact, if what we’re doing can encourage more of the center (the people less likely to go to any sort of protest) to get out and actually start attending some of these one day things, that would still do a lot. If we start marching beside them, maybe they’ll start to feel a little of the solidarity and see what we’re about, or be encouraged to start a sustained protest directly aimed at the cause of ending the war.